A Celebration of Yorkshire Pots, 1997, p. 34, plate 30. Shown here are other items from the service. The teapot is 4.65 inches high, sugar box 3.25 inches. Maker: William Smith & Co.
An earthenware coffee pot with a French Empire shape printed in black with a floral pattern and underglaze painting and pink luster added. 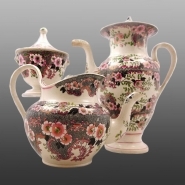 It is part of a coffee and tea service (other pieces are shown below). The "Wedgewood" mark is found on one of the pieces shown on this page. Smith used the "Wedgewood" name until a law suit by the Wedgwood Company and others was filed against William Smith & Co. on the 8th of August, 1848, causing the company to cease this practice. Reference A Celebration of Yorkshire Pots, 1997, p. 34, plate 30.